Simon Benson House. From Wikipedia. Image by Another Believer, 4 Feb 2012. Classified as Queen Anne, this home was built in 1900.
house was moved 3 blocks south to its present location. The building may be categorized as LATE VICTORIAN - Queen Anne Style of architecture. The building was listed on the National Register for Historic Places on August 11,1983. Although moved in 2000, the building remains eligible for listing in the National Register under Criterion "C" as a rare extant example of building once prevalent in Portland's West End by the South Park Blocks. It is also noteworthy for its association with Simon Benson, a leading businessman who played a defining role the development of Portland in the 19th century. The Benson House is located on a double lot at the southwest corner of Montgomery Street and Park Avenue in Portland's West End district. Once a neighborhood of similar upscale Victorian houses, the area surrounding the Benson House evokes the organic heritage of the district. In the 1920s, low-rise apartment buildings began to replace the houses. High-rise apartments appeared in the early post-World War II years. In 1952, Portland State University relocated its campus from North Portland into Lincoln High School at Broadway and Market Street; over the years, PSU expanded to the surrounding blocks, as often absorbing existing buildings to institutional use as building new edifices to education. This setting mirrors organic development surrounding the Benson House's original site, at the northwest corner of Block 243 of the Portland Addition to the City of Portland. Like its current setting, the house occupied a corner lot on a traditional 200 by 200 foot block. Also on Block 243 were the Hochapfel House, since demolished, a multi-story, half-block research library/administrative office for the Church of Latter Day Saints, a multi-story apartment building and a two-story commercial structure. Catercorner was Clay Towers, a high-rise affordable residential structure. Across the street to the west was a five story 1908 apartment building and across the street to the east was the Calvary Presbyterian Church, presently adapted for use as a community center/performance hall. As built, the house was set on an oversized corner lot, slightly set back from the lot line (approximately 5-7 feet). Rectangular in form, the house measured approximately 27 feet across (extending to 33 feet with matching bay windows) and 56 feet in length. The house was oriented lengthwise. Access from the street was from the corner with concrete steps faced with ashlar leading to a large front porch. This porch, 5 to 7 feet deep, defined the primary street fa9ade and led to the primary entrance at the center of that fa9ade. Accentuating the corner, however, the porch also wraps slightly around the secondary street fa9ade. The porch features square posts paired and fluted in imitation of classical columns. Balcony and porch railings are devised of wooden grillwork with miniature Moorish, or horseshoe-shaped arches framing the rectangular openings. This definition is repeated in lesser scale at the second floor with a sleeping balcony. It is further repeated on a rear porch at the back of the secondary street The house itself is balloon wood frame construction, 2 !/2 stories in height. It rests on a basement and foundation of concrete. The base course is faced with random-range ashlar. Exterior walls are clad in lapped weatherboard. The roof is asphalt shingled and varied in form, including hipped and gabled roofs with jerkin-head gables distinguished by bracketed hoods. In addition to the two porches at the front, the house also has a rear porch with entry. Windows typically are double-hung, wood-sash, one-over-one. Wide, rectangular plate glass windows with sidelights and leaded glass top lights are typical on the street elevations. Stylized repeating ornamentation and a belt course of repeating rectangles are suggestive of the Eastlake tradition. As built, the floor plan featured an entry hall off the front door. This hall led to stairs to the second floor. To the right along the primary street fa9ade was a 9-foot by 12 foot receiving room. Moving to the interior were a parlor and dining room of equal size. The rear of half of the house was dedicated to service areas, including the kitchen. The second floor featured an irregular central hall leading to three primary bedrooms at the front of the house (all of approximately equal size), then to a fourth smaller yet still primary bedroom and then a series of smaller service rooms at the rear. At the center, this hall also included a stair leading from the second to a third floor bedroom and attic spaces. In the 1930s, the Simon Benson House was turned into a boarding house, and then later divided into apartments. Over the years, it suffered from deferred maintenance and neglect. In 1991, the City condemned the property as a dangerous building. By the mid-point of the decade, the house was no longer weather-tight and routinely occupied by vagrants. 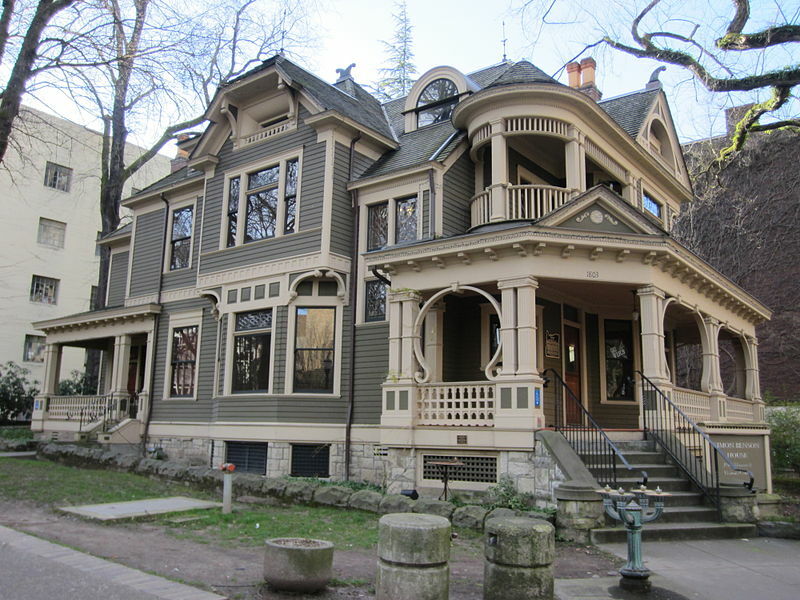 In 2000, to preserve this important landmark, in an unprecedented Oregon public-private historic preservation effort, the house was acquired, moved to its new location, rehabilitated and adapted for use as Portland State University's Alumni Office. In the course of relocating and rehabilitating, the building's orientation and character-defining elements were preserved or in some cases restored. All work was completed in accordance with the Secretary of Interior's Standards for Rehabilitation. The house retains its fundamental orientation and primary points of access. It is located on a corner lot of comparable size to its original. Primary access continues from the corner to the wrap-around porch and front entry. A secondary ADA-accessible doorway was installed off a garden by enlarging a window opening. A new concrete foundation and concrete entry stair were installed. The original Ashlar was inventoried, numbered and reinstalled at the new stairs, foundation and retaining wall. All exterior walls were retained. Exterior wood skirt and lattice were inspected, repaired and where necessary replaced in kind. Exterior lapsiding was inspected, repaired and where necessary replaced in kind. Existing porch balustrades and railings were reused where possible; replaced in kind where not. Windows were inspected, repaired and where necessary replaced in-kind. Decorative trim, moulding, and similar elements were inspected, repaired and where necessary replaced in kind. New roof flashing and gutters were installed, maintaining location and profile. Inappropriate modifications were removed (e.g., fire escape). The exterior chimney was documented and reinstalled to the degree possible, with infill bricks of matching color and texture. The roof ridge and finial were reinstalled per historic photographs. As a result of the rehabilitation efforts, leaded windows stolen from the house in 1999 were located, returned, rehabilitated and reinstalled. At the rear of the property along its length, a gated decorative brick patio has been installed. This patio provides an appropriate access way that meets ADA standards, through the new door mentioned above. The garden is sympathetic in design but modern in materials and clearly distinct from the architecture of the house. The primary interior spaces were retained while strengthening the building's seismic performances, installing modem mechanical equipment, installing modern fire and life safety systems and adapting the service areas for conference and office use. In the front primary rooms, interior finishes (walls, flooring, ceiling) were kept intact and rehabilitated, except along the primary stairwell where the wall was replaced to provide seismic strengthening. Similarly, on the second floor, finishes in the four primary bedrooms were retained, except for the replacement of select walls in the original location necessary for seismic strengthening. In the service areas at the rear, walls were demolished. The existing first floor fireplace and surround was rehabilitated. A new stair was installed to the second floor for second egress. Walls defined a conference room, office and storage area. Finishes compatible, though distinctive from the original. The attic area was reserved for use with mechanical systems. Again, a wall was added to improve seismic performance. New wiring, plumbing and mechanicals were installed along with fire and life safety systems. house was moved 3 blocks south to its present location. The building may be categorized as LATE VICTORIAN - Queen Anne Style of architecture. The building was listed on the National Register for Historic Places on August 11, 1983. Although moved in 2000, the building remains eligible for listing in the National Register under Criterion "C" as a rare extant example of building once prevalent in Portland's West End by the South Park Blocks. It is also noteworthy for its association with Simon Benson, a leading businessman who played a defining role the development of Portland in the 19th century. The Benson House is located in Downtown Portland's West End. With only 600 feet separating the old and new sites, the heritage of both sites is essentially the same. When Simon Benson built his home at 11 th and Clay Street, the area was nearly entirely comprised of single-family residences. The residential flavor was only disrupted by anoccasional church and a public school at the east. This development occurred relatively quickly, beginning in the early 1880s when the City's population grew by 70% and ending with the population explosion following the Lewis & Clark Exposition. In the 1890s, the traditional 200 by 200 foot blocks were generally divided into quarter block parcels with a single home, though there were a few full block and half-block parcels. Much of the land to the south and west was still vacant. The neighborhood was for the well heeled; one observer considered West Park Avenue a boulevard of formal Italianate mansions. By Benson's arrival ten years later, the area was still nearly exclusively residential, though a bit denser with the full block mansions giving way to 8 smaller dwellings and an occasional duplex. Although zoning would not exist for nearly three decades, this portion of the West End had no commercial or industrial enterprises. apartmen s such as Park Plaza and lone Plaza. At the end of the decade, urban renewal led to the creation of the Portland Development Commission that targeted the 44-block South Auditorium area; displacement fueled more transition in the West End. In the 1960s, PSU launched a major development campaign, building full-block buildings such as Cramer Hall, Neuberger Hall, West Library, Smith Center and two Science Buildings. Commission, City agencies, public charities, private donors and individual volunteers to seek a solution. Portland State University agreed to donate the land for the building and the Portland Development Commission assisted in funding the move. For nearly two years, the move and subsequent rehabilitation was planned to ensure the integrity of the resource. Today, the Simon Benson House serves as a University meeting space and houses the Office of Alumni Relations. Simon Benson was born in Gulbarns-dalen, in south-central Norway on October 7, 1852. He is one of seven children, including four sons, of Berger Iversen and Karen Stenersdatter. He had little formal education, going to work at the age of 9. His oldest brother, John, left the family farm in 1863 and emigrated to Wisconsin, where he worked in the pine woods until he was able to send for his family. In emigrating, the family shortened their name to Benson and settled in Wisconsin in 1868. Simon Benson began his career in America, working as a farm hand and in logging camps in Wisconsin. At age 23, he married and opened a store in Lynxville, which was destroyed by fire four years later. He moved with his wife and child to the Pacific Northwest, arriving in Portland in 1879. Hotel (1912) and the Columbia Gorge Hotel (1921). much as $90,000. Benson also donated to the City of Portland several hundreds of acres of land along the Columbia River in Multnomah County for scenic preservation. Today, most of the donated land is under state ownership, including an 84-acre tract maintained as Benson State Park. Other results of Benson's largesse and personal interests were the endowment of Benson Polytechnic School in Portland and the installation of 20 bronze public drinking fountains in downtown Portland. Simon Benson is credited with having been the first to introduce donkey engine railroad logging to the Pacific Northwest, converting from ox and horse logging steam power. He is most celebrated for having built up an export market for logs of special lengths and sizes and for devising an ingeniously economical method of floating them to San Diego in huge, cigar-shaped rafts - sometimes containing as many as 5 million board feet. When he retired from the lumber business, Benson sold his mill in San Diego and his 25,000 acres of Oregon timberland for $5.5 million to investors in Duluth, Minnesota. The State of Oregon honored the Norwegian immigrant lumberman with designation as Oregon's "First Citizen" on August 17, 1915 for his work in creating the state highway system. Governor James Withycombe named Benson to represent the state as "First Citizen" at the Panama Pacific International Exposition in San Francisco and two years later, appointed Benson to the first State Highway Commission composed of private citizens. He served with distinction as chairman throughout his three-year term. Benson lobbied for legislative action providing for the first state road bond issue of $6,000,000. Under Benson's leadership, several trunk line roads, including the Columbia River Highway, the Pacific Coast Highway, and the Dalles-California Highway were adopted as the official highway system of the state. Benson spent the later years of his life in Southern California and died in Los Angeles on August 5, 1942. He had three children by his first wife, Esther Searle Benson, whom he married in Wisconsin in 1875. They were Amos, Alice Benson Alien and Caroline Benson Unander. Following the death of his first wife in 1883-4, Benson married Pamela Loomis in Chehalis, Washington. Benson's children by his second marriage were Gilbert and Chester. Benson was married a third and final time to Harriet King of Hood River, Oregon in 1920.